A few years ago I did a comparison of the results from online trip planners. Here’s an update of sorts. I tested 247 Flinders Lane (which is an address on a one-way street, in an area with lots of turn restrictions and pedestrian streets) to see what the various navigators would do. For the destination I just put Bentleigh (my neighbourhood). Yahoo Maps couldn’t give me an answer, reporting that “Driving directions cannot be determined between these locations”. I tried giving it a specific destination, but it wouldn’t do it. Google decided that just entering the suburb for the destination would go to the post office. The directions are pretty good, but St Kilda Junction confused it; you don’t (you can’t) turn at Fitzroy Street when headed southbound; you turn briefly onto Punt Road, which then leads you onto St Kilda Road. Curiously it’s led me to somewhere well outside the logical centre of Bentleigh, though it might be the geographic centre of the suburb. It figured out St Kilda Junction, but got the initial directions completely wrong, directing me to turn into Degraves Street, which is mostly closed to traffic, and then to do an illegal right hand turn from Flinders St into Swanston St. I kinda like the use of landmarks for directions though. This one has also led me to the post office. Unlike the others it preferred Kingsway to St Kilda Road, but I can’t see any flaws with its logic, though it did decide I should go all the way along Union Street to Punt Road — that may well be faster than turning off Union Street at St Kilda Road. And for non-drivers, how about Metlink’s journey planner? Metlink decided “Bentleigh” meant a street next to the railway station. Not sure why. The instructions to walk to the station assume that Royston Place is a thoroughfare; It’s a deadend; you can’t get to Flinders Street station that way. Update: Ah, it assumed I was starting in Royston Place, not walking through it. Not sure why it would do that though. And it didn’t send me via the quickest pedestrian route, which is the Degraves Street subway. But the train trip itself is correct. Unknown why it thinks it’ll take 7 minutes to walk 50 metres at the end of the trip. Maybe it’s adding a bit in case the train is late, or you have to wait for a train at the level crossing. So, Bing gave the best result. All the others appear to need some attention. 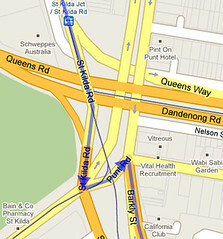 A while back I actually tried to use Google Maps for navigation around some unfamiliar areas; I had it trying to make me drive through a military base (in Point Cook); turning left from Kings Way heading south into the West Gate Freeway (which is not physically possible); and turning into the Southbank foot path in front of Freshwater Place to get to the Eureka Tower (which would be the best path if I were not driving, I guess). Hey! I use public transport whenever I can, but I’m still a driver too! Also, in Adelaide (can’t remember exactly where) recently Google wanted me to make a left turn and then a U-turn, instead of just a right turn!!! I always check Google and Whereis for a comparison, but in general I find Whereis is better. One of my friends has a GPS in her car. One time, we needed to travel from the local Westfield to a park less than 1 km. In fact you can see the park from the top level of the carpark. I drove to the park and waited for her. After about 30 minutes I called her, she was 20 km away and headed for Darwin. There is apparently a park with the same name in Darwin. She then got lost on the way back, and she lives in that suburb ! I often put the online ones to the test just to see what they recommend. The online ones like Google and whereis are getting better than they used to be. They used to make a lot of crazy suggestions. I recently had to drive from Sydney to Dubbo. According to their computer, from Epping in Sydney to Dubbo, you should go via the Hunter Valley. But from Eastwood, 1 km from Epping, you should go via the Blue Mountains and Orange. Remarkably both are correct since the distance is almost identical either way. I live in the outer northern and I go shopping at malls near me. I use my navigator to go to places I dont know where to go. As most folk know, the Adelaide CBD is bound by North Terrace, East Terrace/Hutt street, South Terrace and West Terrace. However, East Terrace is a popular name for roads around the suburbs as well. I have used Google Maps and the UBD on Disk on my computer to plan routes when I’m going places around town. When I’m in the car, I use my Nokia N95 as my GPS unit (surprisingly cheap) making use of either Nokia (Ovi) Maps or Google Maps (Nokia Maps mostly because it uses GPS rather than A-GPS and is thus more accurate in its positioning). BUT – it doesn’t matter *which* of these I use – computer or phone, UBD, Nokia or Google – *none of them* will give me the correct East Terrace when I wish to go from the eastern side of the CBD to *anywhere!!!! * (or vice versa). Whenever I tell a navigation system to take me from or to East Terrace Adelaide 5000, it *always* chooses East Terrace in either Thebarton or Mile End, both suburbs to the west and the former slightly north of the city and *nowhere near* the East Terrace I want! This has been happening for over two years through several updates and new versions of all these navigation systems, a bizarre bit of behaviour in what are otherwise reasonably efficient and reliable systems.